Mommy and Daddy were sick on Halloween so Miss Joni had to take me Trick-or-Treating with her family. Mommy and Daddy were very upset to miss the fun. This year we all had Monsters Inc. costumes. I was Mike. 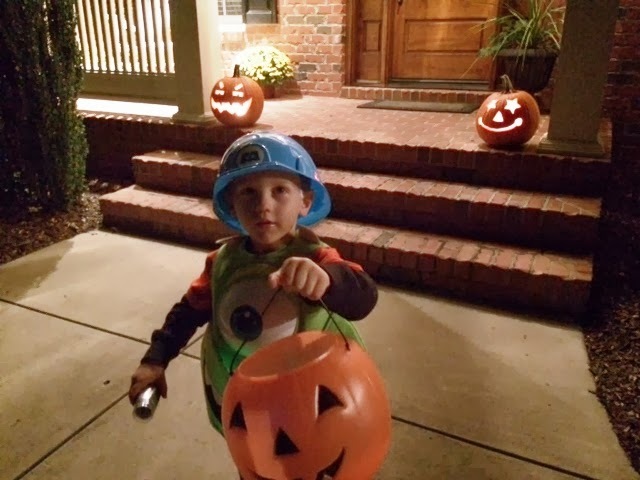 Trent wasn't sick, but Mommy and Daddy didn't have the energy to put him in his costume. So that dude totally missed out! Daddy was going to be Scully. Side note - I got the stomach bug on the Wednesday after Halloween and knock-on-wood, it skipped Trent. 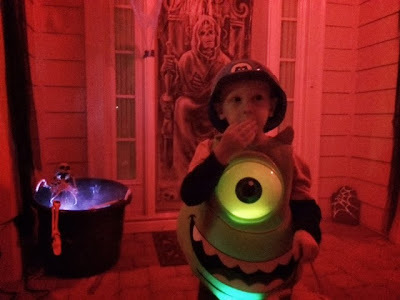 Mommy put a glow stick under Mike's eye ball so my costume had a wonderful green glow! Mommy lets me have 2 pieces of candy after dinner every night. I never forget to ask for it. She uses it to bribe me to eat a spoonful or two of veggies. I am learning to hide them in cheese. Mommy and Daddy left us over the weekend so they could go see Aunt Jenny marry my new Uncle Balex. I will show you a picture soon as Mommy can snag a good one without a watermark on it! Being brave at the scary house! Who is in 1st and 3rd? Last week I went to my first chess camp. When Mom picked me up from camp on Wednesday we had to go to her doctor because she had hives all over after being bit by some fire ants. She was fine after she was treated in the office. On the last day of chess camp, I won 3rd place for the beginner group. Friday night we went to a farm in Durham. It was just ok - there was no hay in the hay ride. At least the animals were cute and fun. 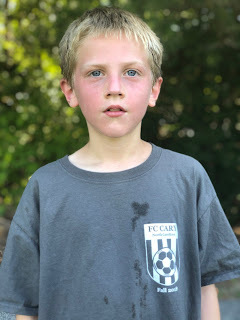 Trent and I are playing in another soccer league. Our first game on Saturday was hot! Today was our first day of school. We are sad summer break is over! 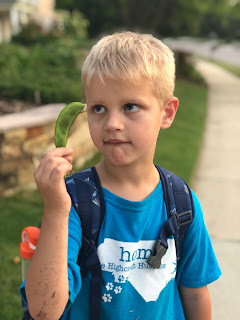 In kindergarten we started some bean plants which we got to take home. We planted my bean plant in my front yard. It is now producing beans. I do not like the taste of them. I will let Mom eat them. We had a PTA picnic at school on Friday. Mom, Alden, and I helped run a "musical spots" game. Alden played the music and I ran and picked up spots. 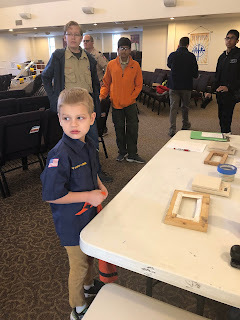 We did our first pinewood derby on Saturday. We didn't win, but we look forward to next year!